The Department of Psychiatry at the University of Cambridge is pleased to announce one, possibly two, Medical Research Council (MRC) supported PhD Studentships (part-funded by NIHR) to start in October 2011. The Department has an outstanding international reputation in the field of psychiatric research, rated the best psychiatry department in the UK and in Europe, and has excelled in the last three Research Assessment Exercises. The Department welcomes applications from candidates with a good first degree in psychological, biological, medical, clinical, or mathematical sciences for a studentship to conduct research for a doctoral degree. 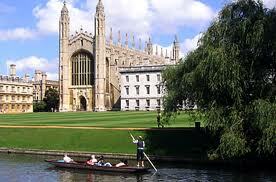 Information on neuroscience in Cambridge University can be found at http://www.neuroscience.cam.ac.uk/. Names of potential supervisors from the Department can be found from the webpage at http://www.medschl.cam.ac.uk/research/Themes/neuro.html. Candidates need to put forward a potential project title together with a research proposal. This may be done informally in conjunction with a potential supervisor by email. Applicants for the studentship should have, or expect to gain a first or upper second class Honours degree in an appropriate subject, and may also have completed further research training or a Masters degree. The research council studentship stipend will be paid at RCUK rates for the duration of the award and fees are met. To apply, please post 10 copies of the following documents to the address below: i) a full academic CV (including contact details for at least two academic referees), accompanied by a letter of application indicating: i) why you want to conduct research in Cambridge, ii) your preference for PhD supervisor or supervisors if more than one choice appears possible; iii) an outline of your current research interests and any completed research conducted; and iv) a clear statement of your eligibility for this MRC funding award (see below). Applications (10 copies of (i) – (iv) above) should be posted to the following address: Adisa Pamukcic (Education Administrator), University of Cambridge, Department of Psychiatry, Douglas House, 18b Trumpington Road, Cambridge, CB2 8AH. Please do not send electronic applications only. The eligibility requirements are detailed here official website. Further information about MRC PhD studentships is available from the MRC official website. Enquiries regarding the administration of the application process, or potential supervisors, should be directed via email to the Education Administrator, Adisa Pamukcic (email: ap686@medschl.cam.ac.uk tel: + 44 (0) 1223 746 105). Closing date: 25 February 2011. Planned Interview dates: Interviews will be held during March. Demikian kami sampaikan tentang Medical Research Council PhD Studentships, Department of Psychiatry, University of Cambridge, UK semoga informasi tentang Medical Research Council PhD Studentships, Department of Psychiatry, University of Cambridge, UK ini bermanfaat.